How to organize your gear to increase focus in baseball! You love playing ball. You want to increase your focus on baseball, and not waste time trying to keeping track of your equipment. The chaos in the dugout can make it difficult to keep your head in the game. The Dugout Manager will get you organized so you can focus on the game. Your gear is important – you don’t want to see it getting kicked around or destroyed on the dugout floor. Players who use our organizer have their gear ready to go, so they can do what they enjoy most . . . PLAY BALL! The dugout manager The DOM will organize all your equipment as well as manage some of your other stuff – like your jacket or towel. The unique design will even keep your drink secure! No more lost or spilled drinks. The DOM makes it easy for you to switch from outfield to infield quickly! Effective players have to keep their head in the game. Let the Dugout Manager organize your equipment so you can do what you love most- play ball! Organize your gear. 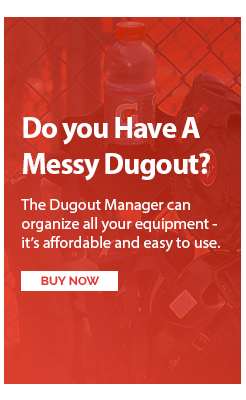 Order the Dugout Manager today! For International, Scholarships do visit Scholarships for students website. My husband gallops thoroughbred horses for a living, he has to wear a helmet, and vest that are very expensive, this would be perfect for hanging them up. My son and I often practice at the park where there is plenty of chain link fence but not necessarily any bat racks or other holders. We got tired of having to go around the fence to a bench to change equipment, and even more tired of having to clean off dirt from gloves, catcher’s mask, hats, water bottle, etc., (or even worse, tripping over a bat), when dumping these equipment items on the ground. With the DOM, it takes a second to conveniently hang multiple equipment items right next to us on the fence. It is sturdy yet very light weight. We are gonna love using this during spring ball practices, and can’t wait to show team members the benefits of this wonderful invention. So glad we found out about the DOM. “Hats off” to your company for a fantastic, useful product!